Add Impressive Routing to Your 500 Series Rack! 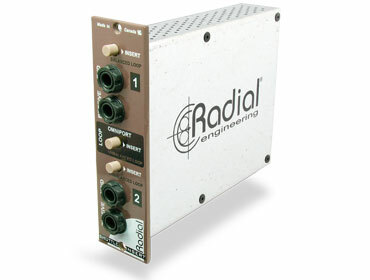 Put a Radial Shuttle insert loop module in your 500 series rack, and instantly upgrade your rig's routing. Although Radial built the Shuttle with the already flexible architecture of their Workhorse in mind, it's perfectly at home in any 500 series rack. No matter what 500 series rack you stick the Shuttle into, it provides you with both a balanced and an unbalanced send/return-style front-panel insert point. It's as easy as hooking up the output of any module or other piece of gear to the Shuttle's input and selecting the insert type from the front-panel controls. Where the Shuttle gets really impressive is when you add it to your Radial Workhorse. First, you get a third insert routing point, by tapping into the Workhorse's Omniport TRS-style send/return loop. That lets you set up custom inset chains, right off your Workhorse's mix bus. Very cool. You can also use the Workhorse's FEED control to cascade modules right into the Shuffle, giving you the option to send the signal out directly from the source (dry), from the Shuffle (wet), and from the Workhorse mix bus - all at the same time! That adds a whole new dimension of usefulness to your 500 series rig, especially for live recording.